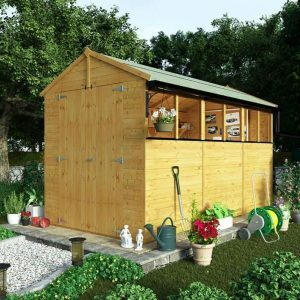 With its impressive size, the BillyOh 5000 12 x 6 Wooden Shed is one very eye catching shed. 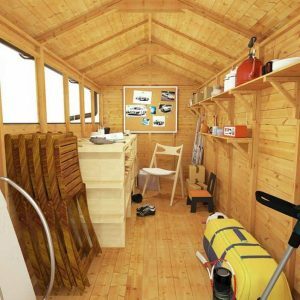 The vast amount of space this shed offers means that all your storage needs will be taken care of. 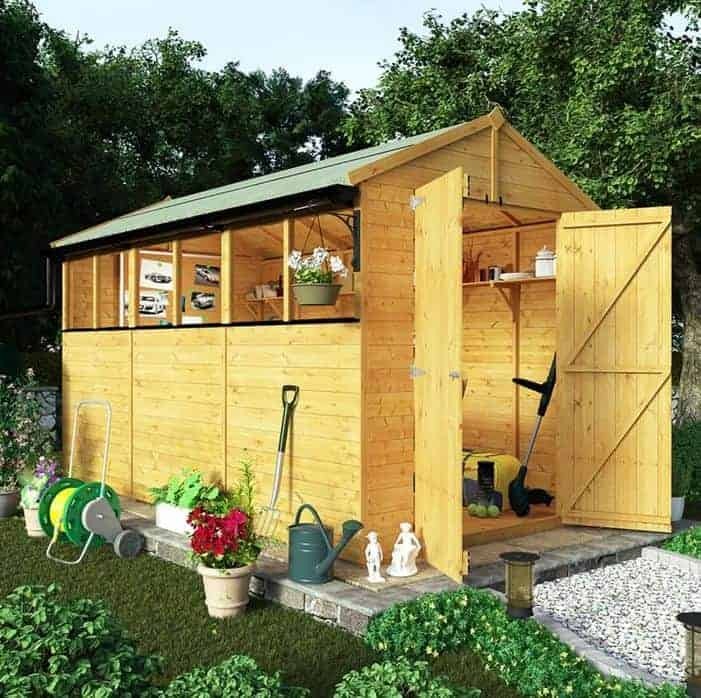 Also as it offers you so much room, this shed would work very well as a workshop for you to tinker away on all kinds of DIY projects. The shed is very comfortable as it offers you large double doors to make getting in and out easy. Six fixed windows so there is plenty of natural light getting inside. Plus it has an extra high roof to make walking around inside the shed as comfortable as possible. 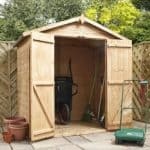 For under £600 you are getting a very well made shed here. The cladding is tongue and groove shiplap cladding that is made from European softwood. This is attached to a very robust frame which will give the shed a very long lasting life. Tongue and groove cladding has also been used for the roof which looks great, but also ensures the roof is just as strong as the rest of the shed. 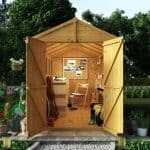 Due to the impressive way this shed has been made and the materials used, this is a shed that is going to give you a lifetime of use. Today we are looking at the very impressive BillyOh 5000 12 x 6 Wooden Shed. This is one of the bigger wooden sheds we have looked at recently and we just love how large this is. 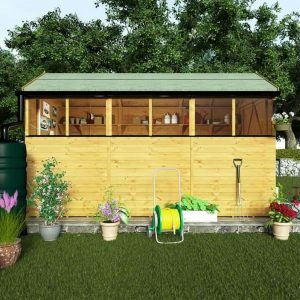 With 6 feet 5 inches of width and 11 feet 8 inches of depth, this is perfect for those who want something more than a shed. Do not get us wrong this would work great as a shed, but its immense size means that it would be ideal as a workshop where you can do all kinds of cool, fun and most likely dangerous projects. The headroom is as impressive as the floor space. Along the ridge you have 7 feet 3 inches of headroom and along the eaves you have 5 feet 9 inches, which is a few inches more than we are used to seeing. The extra headroom will make spending time in here comfortable as you will not need to hunch over. The roof is very impressive. We love a large apex roof and this one really did catch our eye. It is made with tongue and groove boarding, so it looks fantastic. This kind of boarding is extra strong and when a roof is as large as this, you want it to be that extra bit robust. Covering these boards is some very nice mineral felt which will protect the boards very well from the rain, snow and the annoying cat from down the street. The BillyOh 5000 12 x 6 Wooden Shed is made with thick tongue and groove shiplap cladding and it looks awesome. They have managed to give this a rather smooth look, but at the same time as this is made with European softwood it has a very workshop kind of vibe as well. The cladding will keep anything you put inside safe from the elements and it is also thick so it is very strong. Sometimes when a shed is as large as this it can feel not quite as solid as a smaller shed, but thanks to the 25 mm x 25 mm framing this is going to feel like a very robust shed. The cladding and the frame together make this one very strong unit. The frame is very well made and we really like how it is not overly thick so it does not eat too much of your storage space. If you want a floor, then you have to add it as an extra. This is something we are not too happy with. To be fair, the flooring does only cost £52.99 for the basic solid sheet boarding floor, but we feel they should have just added this to the shed and put the extra £52.99 on the overall price. They do have a much stronger and easier on the eyes tongue and groove flooring, which costs £69.99 and is actually not a bad price at all. 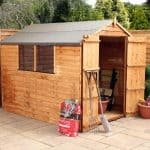 We really like the way the BillyOh 5000 12 x 6 Wooden Shed looks and it would be a shame for it to start to rot and decay. Well to avoid that you will have to give it a coating of wood treatment shortly after construction. We always suggest you do it sooner than later. A fresh coating should be applied on an annual basis in order to keep that cladding looking good. As long as you follow the instructions for treating the shed, then you will be given a very fair ten year anti rot guarantee. This is a similar kind of guarantee that most sheds of this size offer these days, so it is very fair. On the front of the shed there are a set of large double doors. We love double doors as it means you do not have to move things in weird angles like they are Tetris pieces to get them in the shed. At 3 feet 10 inches wide and 5 feet 7 inches high, even Andre The Giant carrying a mower on his back will be able to get in here without much hassle. The doors are also very well made. They are extra strong thanks to the double z framing and the hinges they have used. Many sheds these days use two hinges on a door, but this one actually uses three and that third hinge in the middle will help keep the doors strong. The BillyOh 5000 12 x 6 Wooden Shed will be very illuminated during the day, as one side of the shed has six fixed windows. These windows are made with styrene so they will not shatter like glass and they also give the shed a more friendly and open kind of appearance. We do feel that they could have made a couple of these opening windows or even offer this as an upgrade. The doors actually close very securely as each one has a turn button catch, but there is also a pad bolt. However, there is no lock included so you will have to add some kind of padlock if you want extra security. To be fair, though, many sheds do not come with a locking mechanism, so we cannot be too harsh on this one for that. As much as we really like this shed, you are not really getting a whole lot of privacy as one side is covered in windows. Adding some blinds would be a way to keep things hidden or even just give yourself a bit of shade if you are working in here. Like other sheds in the BillyOh range there are some great customisation options with the BillyOh 5000 12 x 6 Wooden Shed. They offer a great range of colours for the shed. They offer 12 different colours which start at £15.90 for Harvest Gold and go up to £49.99 for Gun Metal Grey. They also have a range of trim colours. Each of the three trim colours comes in at £15.99. We must say we used to wonder who would want a trim on a shed? But when you see a shed with a trim it really does finish it off nicely. There are some extras for you to consider with this shed. First of all they have a range of shelving options. These range from a simple set of three shelves which cost £31.99, to a set of shelves for two sides of the shed which cost £61.99. Guttering is another thing that you can add to the shed. They offer both standard and premium guttering which starts at £39.99 and goes all the way up to £94.99 for both sides. If you do not want rain running down you shed, then guttering is the way to avoid this. We are very impressed with the quality of this shed. Especially when you consider just how large it is and how reasonably priced it is. 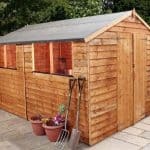 This is a shed that could give you a lifetime of use, but in order for this to happen you are going to have to help it out and look after it properly. You have just a ton of space at your disposal with this shed. So much that it can be used as much more than just a basic storage shed - a workshop, office, playroom or anything else you can think of. This is one very long shed so it may be a little tricky and time consuming to install. Just make sure you have a good friend helping you out and that you take plenty of snack and drink breaks. Even if you were to add the tongue and groove flooring option, this shed still comes in at just under £700. 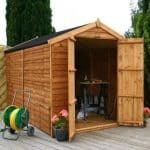 In all, we feel that this is a very fairly priced shed, especially considering the size and the quality of materials used. Final Thoughts: It is pretty much impossible not to be impressed by the BillyOh 5000 12 x 6 Wooden Shed. 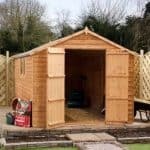 We love its large size and feel that many people who purchase this will be purchasing it to use as something other than a shed and we think that is great. The materials they have used are actually very high quality and we also like how there are so many different colour options for you to pick from. 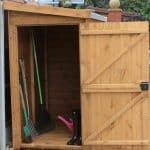 If you want a large amount of storage space or just somewhere to have a little fun, we are sure that you are going to be very happy with what this shed offers.